So ultra training means multiple 20+ mile runs. Coach told me early in the year that if I wanted to work in some races for my longer runs to make it more interesting, let her know. 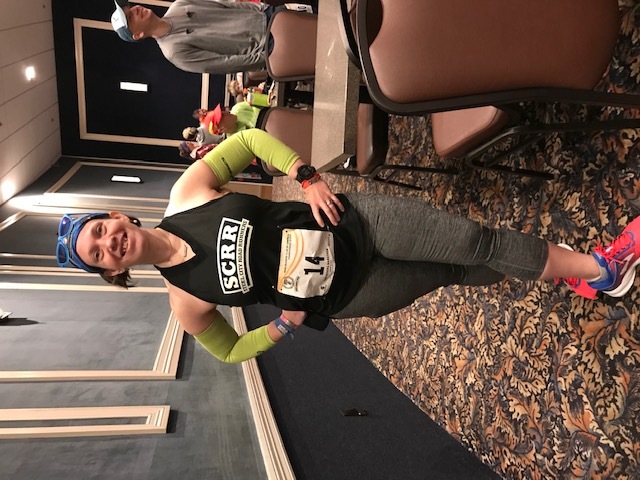 So, loving the bling as I do, I went in search of spring marathons–and found the Two Rivers Marathon Festival, which offers 4 distances (5k, 10k, half marathon and marathon) on both Saturday and Sunday. Medals offered for all distances. I can get a medal for my recovery run too? Sold. Signed up for the marathon on Saturday and the half marathon on Sunday. In addition to offering all four distances on both days, the race has nice shirts, offers jackets for people who complete races (any combination of distances) both days, jackets for people who complete two marathons or two half marathons over the course of the weekend, there are special shirts for those who BQ on the course (lots of downhill to flat…high percentage of BQs). And the medals are huge! There is an animal “mascot”/logo each year and participants are polled for what animal they would like to see, and then the winner is incorporated into the medal and shirt/jacket logos for the year. Amazing swag. Really love it. 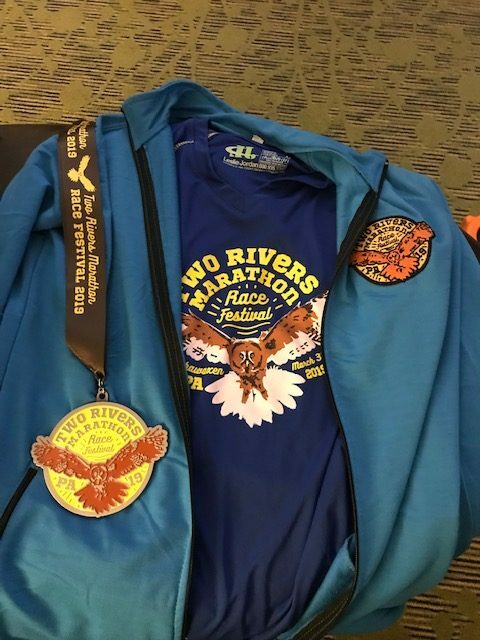 Race Swag–shirt, medal, jacket for doing two events. So I sign up, and then realizing I’m going away for the entire weekend, ask if anyone in my circle wants to come with and run a couple of races. 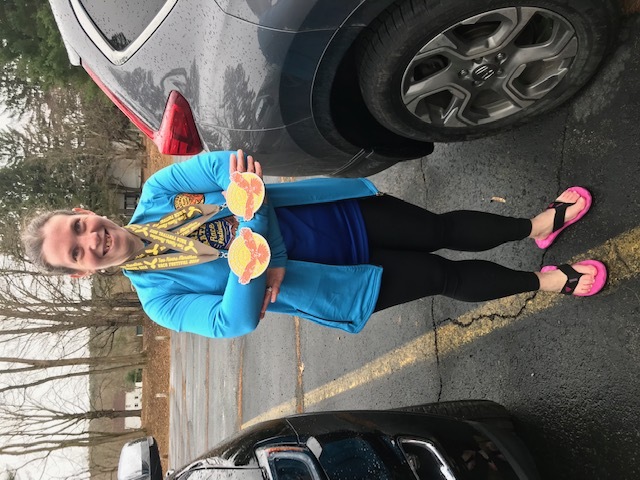 Naomi took the bait (hahaha)–she was looking for a half marathon anyway, and hey she also needed recovery miles on Sunday. Half marathon and 10k it is. We started planning our trip–found a hotel that met our criteria (fridge/microwave in room and hot tub) about an hours drive from the race and booked it. The race director sent multiple emails over the month or so before the race to update on details–shirts and jackets are in! Medals are in! Weather for race weekend looks great!–it was neat to have that kind of genuine and excited communication from the RD. We packed up our stuff, and headed out on Friday for packet pickup. Little did we realize (though perhaps we should have) that we were headed for Deliverance. Two Rivers takes place across the state, in a little town called Lackawaxen, PA. Upon arrival we learned there is no cell reception there (thank goodness the GPS lasted long enough to get us there, and we remembered enough to get out). We parked at a scary looking general store (complete with “Deplorables Welcome” and “cashier is armed” signs on the door) and walked across the street to the park to get our bibs and swag for the weekend. Packet pickup was unremarkable if slightly disorganized, but hey, it’s a small low-key race, there were two people there (one doing bibs, one handling the rest of the shirts/jackets) and it’s not like there was a mob of people picking up. We helped the guy find our jackets and moved on with our lives. Got to the hotel, checked-in, unloaded and found food, which was easy–we were staying about an hour away from the race itself. While I didn’t love having an extra hour of driving on either side of the race, given the area the race was in, I’m glad we opted to stay further out. It was worth it to have the luxuries of civilization–multiple restaurants around the hotel which made eating easier, Walmart and Target for items you might have forgotten, gas nearby for refueling, cell phone reception, etc. The extra drive was well worth having needs easily met. We came back and prepared for the Saturday events. So Saturday morning, we’re up and at ’em early. Chilly to start, but predicted to be in the 60s by the time I’m done, so I roll sleeveless (with arm warmers) and capris. We drive the hour to the finish, and get on a bus to the start. The first half of the course (well, the first 11 miles) is beautiful rolling hills through a wooded setting along the rivers. It was really pretty. Saturday’s event is larger, so there are pacers for the full marathon (and therefore for the first 11ish miles of the half). Aid stations every two miles–they only offer water and gatorade, but on Saturday they will put anything you want at any of the aid stations for you. I kept my nutrition with me so I could be sure to have it when I needed it. The course was pretty straightforward, but well marked with consistent reliable mile markers and the few turns were called out with signs and markings on the ground. The second half of the course is out and back along the river, but much more flat, which anyone who knows me knows I struggle with. It’s totally a mental thing–I love the challenge of hills, I’m a solid hill runner, and a good downhill runner. I know how to use them to my advantage. Flats feel endless to me. I really struggled with the back half of the course. It got a little lonely since it’s a small field, though the other runners and aid station volunteers were encouraging. I still felt great physically, but mentally I struggled on the flats and it was difficult to keep myself from walking too much. That said…I stayed ahead of the 5:30 pacer until around mile 20. And I managed to pull myself together to eek out an almost 5 minute PR for my marathon time. Official time was 5:38:59. Due to having a significant amount of elevation loss and the flat finish this course is touted for having a high percentage of Boston Qualifiers. I wasn’t last, but I was towards the back of the pack. Everything was still up for me. Some aid stations were running out of cups, but race officials did everything they could to rectify that as quickly as possible once they learned of the issue. The finish line area didn’t have much in the way of refreshments, but had a food truck that runners could get a free item from. The other notable thing about the course is that it is not closed–you are out there with cars. Most were very respectful of the runners, so I didn’t have a huge issue with this. The series also touts generous time limits–none. They’ll wait for the last runner to come in. I was really impressed with this little race series. We didn’t stick around long after on Saturday, I was ready to go shower and get food, so we headed back to the hotel and did just that. Got pizza, and enjoyed relaxing in the hot tub for a bit. Then prepped for Sunday’s fun. Crossing the finish line on Saturday. Sunday morning was a repeat of Saturday, except we also had to be completely out of the hotel when we left in the AM. Scrambled a little getting out, but still got to the finish to catch my bus. Naomi’s race started near the finish on Sunday so I was flying solo. I could tell that I raced on Saturday–I was sore. Which actually really made me happy. I know I could’ve pushed harder on the flat stretch, but the ache told me that I did push and I could be satisfied with that. I got to run the “fun” part of the course again for day 2. Much, much smaller field than Saturday, but still good. It was cooler on Sunday, it rained most of the race (at least for me). Despite racing a marathon the day before, I was cruising on the hills again, but I let myself walk some when I needed it–this was my “recovery” run, after all. Aid stations same as Saturday, though there were not necessarily volunteers at each. There were cups and liquids though, which was all I needed. Mile markers and course markings same as Saturday. Talked to some people out on the course that I’d been leap-frogging with for most of the race. It was a really pleasant experience, and I came in with a respectable time–2:37:23. When I finished on Saturday I said I wouldn’t come back to double. The flat stretch got to me too much, but that the flat stretch was the only thing I didn’t like. I’ve since come to decide that I just need to work on my mental game so I’m not psyched out by flats. 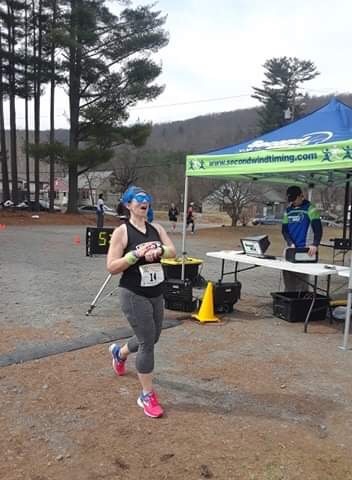 Probably won’t go back next year, but I will most likely go back and get a double marathon at some point, because I really enjoyed this little race series in the middle of nowhere, PA. The RD is in contact frequently. There are free race photos that will be available later this week. He was personally at the race and hands on talking to people all weekend, and is really open to suggestions on how they can improve the experience for runners. I highly recommend this little race festival–beautiful scenic course, great swag, and they are really great to the runners.